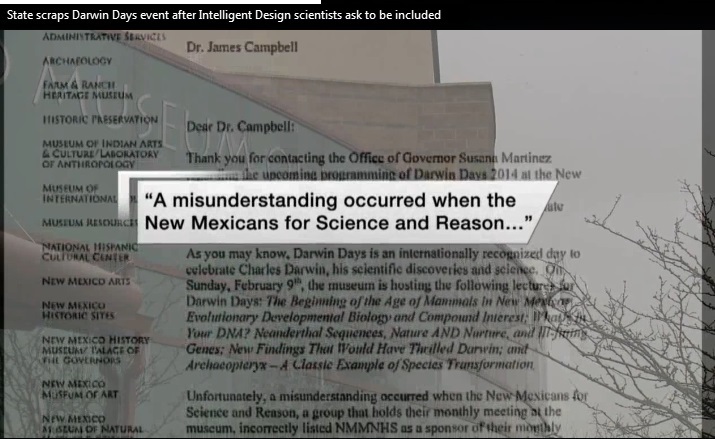 Perhaps you have seen the News 13 story State cancels Darwin Days events after Intelligent Design group asks to be included, or read the Albuquerque Journal story Museum plunged into evolution debate. Did the State really cancel "Darwin Day" to spite the intelligent design movement? 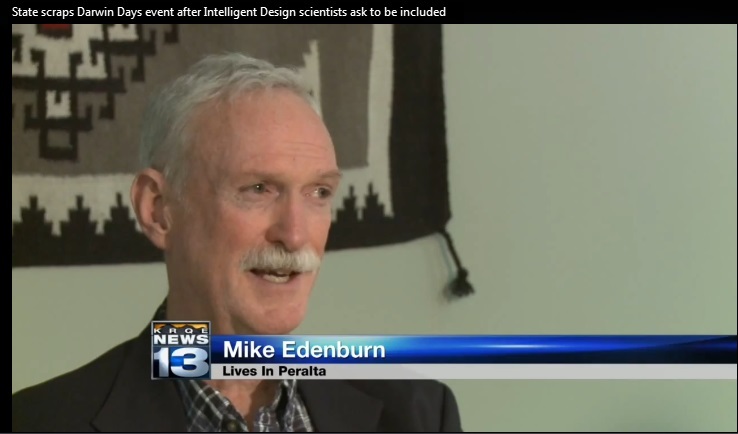 This whole thing was driven by News 13 being conned into running the "story" by the local Intelligent Design (ID) crowd. 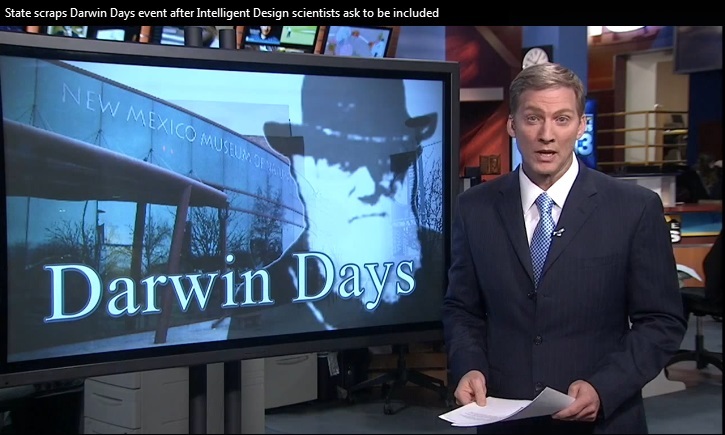 Briefly, the museum had a Darwin Day event in 2014 (OVER A YEAR AGO). There was a brief error of attribution of an NMSR event as co-sponsored by the museum in a flyer, but this was corrected LAST YEAR, BEFORE the event even took place. The museum tried to explain things to the ID folk (this is the Feb. 7, 2014 letter shown on News 13), but by that time the ID people were committed to pushing the false claim that "the museum is sponsoring anti-religion talks, so it should sponsor ID talks too." They made a huge stink about it last year, but then, the local news people knew better than to run a non story. Cut to this year, the museum has a new director, and there wasn't any effort to do another big Darwin Day like the one of 2014. NMSR didn't even do Darwin Day this year, we sponsored Michael Shermer. Here's what the ID people really want: to have the museum sponsor their pseudoscience. 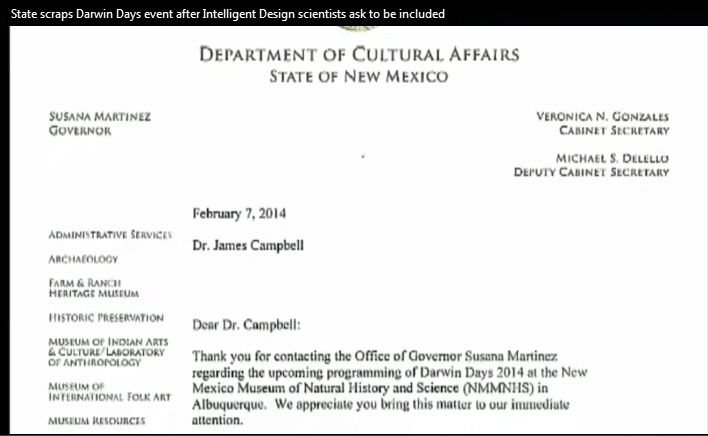 That's why they are saying the museum "cancelled" Darwin Day. But it's not an annual event. NMSR did have a few Darwin Days before, during, and after 2009 (sesquicentennial of Origin of Species and bicentennial of Darwin himself), but our Feb 2010 meeting was about patent law. 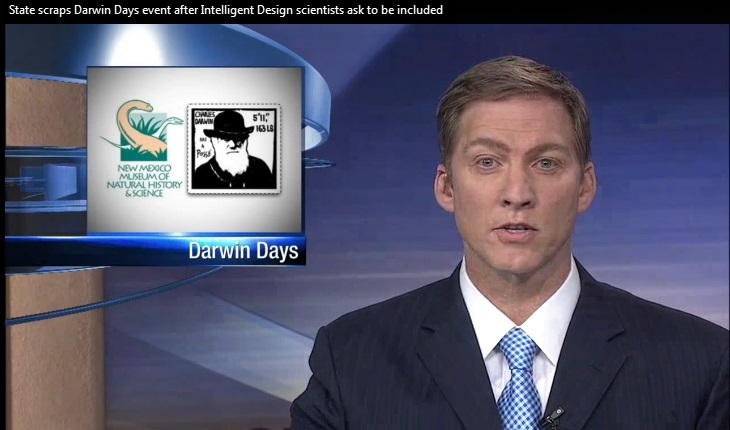 Why didn't New 13 run a story on why we "cancelled" Darwin Day in 2010? Our Feb. 2011 meeting was on early American anthropology. Where was the outrage then? Our Feb. 2012 meeting was on science for the public (w/ Sandra Blakeslee of the NYT). Where were the protests that year? In 2013 we did Lake Monsters. Again, no ID protests, no News 13 "Story." If you want to complain, please don't bother the museum. Tell that News 13 "reporter," Tina Jensen, and anchor Dean Staley, that they were CONNED into running a non-story that makes it look like the ID folks are being "discriminated against." Ditto for the Journal's Rick Nathanson.THAT is the story here. 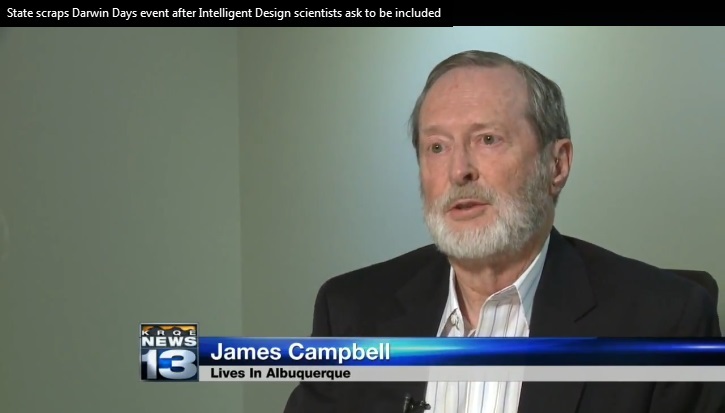 ID Advocate James Campbell, a retired engineer with a Ph.D. with physics, said "It's a very controversial issue, there's a tremendous body of evidence against Darwinian evolution and we think people should be aware of that." Oh, really? The letter. 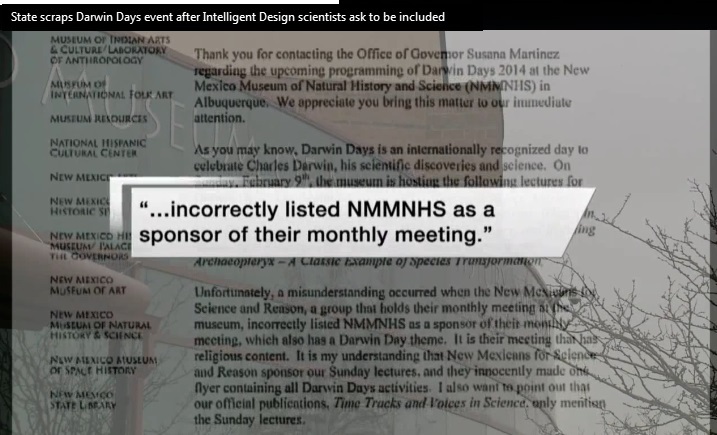 This was written to explain how a brief misattribution of sponsorshiop was corrected on February 7, 2014, two days before the museum-sponsored Darwin Day events, and five days before the supposedly "anti-religious" talks sponsored by NMSR took place on Feb. 12th. Tina Jensen had no idea she was pandering to local creationists by airing their preposterous conspiracy theories as news. 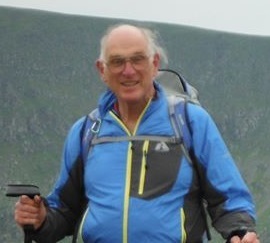 More on Mike Edenburn here. News 13 anchor Dean Staley said "None of the groups involved in planning the Darwin Day events would talk to News 13 on camera...". This comes across to many as saying NMSR didn't respond at all, which is quite incorrect.